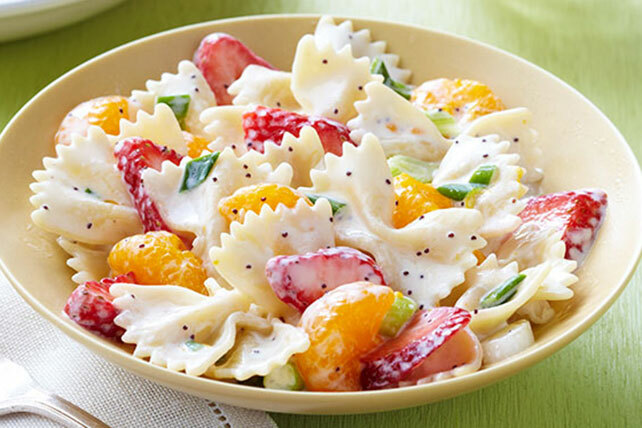 Creamy poppyseed dressing, mandarin oranges and fresh strawberries make for a refreshing twist on pasta salad. Cook pasta as directed on package, omitting salt; drain. Cool. Mix dressing and mayo until blended. Add pasta and onions; toss to coat. Gently stir in fruit. Save 50 calories and 6g of fat, including 1g of sat fat, per serving by preparing with KRAFT Light Mayo Reduced Fat Mayonnaise. If wishing to prepare salad more than 1 hour in advance, combine dressing, mayo, cooked pasta and onions in large bowl. Combine fruit in separate bowl. Refrigerate up to 8 hours. Add fruit to pasta mixture up to 1 hour before serving. Keep refrigerated.